If the big story yesterday was the surge in 10Y TSY yields to just shy of 3.00% (2.996% to be precise), then it is only reasonable that the failure of the 10Y yield to rise above 3.00% overnight is today's "big story", and indeed as shown in the chart below, US benchmark treasuries edged higher, leading most European government bonds, as traders hit pause on the rates selloff amid extremely oversold conditions. “The U.S. yield spike story has been a theme for the last 24 hours but we don’t expect a sharp surge as the U.S. continues to be in a late economic cycle,” said Danske Bank FX strategist Christin Tuxen. Recall that just as investors are curious what happens once yields breach 3.00%, so they want to know how low they could drop if the 10Y fails to penetrate the key level for the 2nd time in 2 months, a question which Morgan Stanley yesterday answered, saying the next stop could be a reversal back to 2.70%. And while we wait to see what happens next, the Treasury curve flattened slightly as the 2-year sector underperformed ahead of today’s supply. Traders have been weighing the implications of climbing bond yields that were in part spurred by higher commodity prices and concern surrounding their inflationary impact on the wider economy. But, as noted yesterday, so far the volatility in interest-rate markets remains low and equity price swings are well off the highs seen earlier this year, indicating investors believe rising borrowing costs may not be enough to cause outsized pain to equities, for now. The bid for bonds, together with strong earnings from Google overnight, helped restore risk sentiment, and global equity markets steadied overnight, with European stocks climbing following gains for most Asian markets as the earnings season picked up steam while Chinese equities soared (Shanghai Comp +2%) following an overnight report from the China Securities Journal that liquidity tensions in China may ease while fiscal spending will increase this week; speculation of further easing from Beijing re-emerged with subsequent similar reports of RRR cuts follow in European morning. After hugging the flatline, US equity futures enjoyed a burst of buying as Europe came online, sending the E-Mini to session highs, up 0.6%, or 16.00 points, to 2,687, and above yesterday's highs. Meanwhile, WTI oil, which according to many has been a key driver behind the move in both bonds and FX, continued grinding higher, rising above $69 overnight, the highest price since late 2014. Still, keep in mind that just as the oil surge propelled risk, and inflation sentiment, so a sharp spike in oil from here could lead to renewed market volatility according to Deutsche Bank. After yesterday's furious short squeeze which sent the dollar soaring the most since the election, the USD steadied in the last few hours as traders focused on whether take-profit interest will emerge after the latest gains or macro bids are enough to support the rally. As a result, the dollar was little changed at about its highest level since January. Meanwhile, the yen decline continued, helping spur Japan’s Topix index to the highest in almost two months; similarly in Europe, the EUR dropped below the 1.22 handle as positioning ahead of the ECB meeting favors downside exposure, while the pound briefly slipped to a fresh one-month low. Australia’s dollar was sold in a knee-jerk reaction to a headline inflation miss before erasing declines as investors were encouraged by the improvement in the core measure, while the New Zealand dollar fell against all Group-of-10 peers after leveraged funds liquidated long positions. Still, don't read too much into today's moves as volumes are below Monday already depressed levels in the FX market. Looking at equity markets, European stocks opened broadly higher with blue-chip stock markets in London and Frankfurt 0.3 percent higher. Markets brushed off further signs that Europe’s biggest economy Germany is losing some of its momentum, with the Ifo business climate index falling in April to 102.1 from 114.7, missing estimates of 102.6. SAP, Europe’s largest tech company by stock market valuation, announced upbeat results in the seasonally tough first quarter. However, Chipmaker AMS reported first-quarter sales towards the lower end of its guidance range on Monday and warned of a downturn owing to weaker orders from one of its main customers. Earlier, Chinese stocks lead Asian indexes higher after Monday’s Politburo meeting and state-backed newspaper commentary signaled liquidity conditions will improve; Shanghai Composite rose 2%, with H shares 1.9% higher. As noted above, China roared higher amid press reports that China has further room to cut RRR and is likely to ease liquidity tension this week. The MSCI Asia Pacific index advanced 0.4%, with Rusal shares rising by around 30% in Hong Kong on hopes of sanction relief, while the blue-chip energy and property names led the upside in the Hang Seng. Still, there remained pressure on technology shares in Asia after a slew of companies reported disappointing earnings. The Philadelphia Semiconductor Index is down more than 7 percent over the past four days. In commodities, aluminum extended its biggest slump since 2005 after slumping 7% on Monday when the U.S. Treasury Department signaled it may lift United Co. Rusal sanctions if Oleg Deripaska divests control of the company. Three-month aluminum on the London Metal Exchange CMAL3 last stood at $2,255 per tonne. Rusal shares in Hong Kong posted their biggest-ever gain. AS noted above, West Texas oil rose above $69 a barrel amid flaring geopolitical tensions in the Middle East and expectations for a decline in U.S. crude stockpiles. DXY has cleared another key upside technical level amidst more widespread Dollar gains and has also eclipsed 91.000. European equities opened on the backfoot, but have seen rebounded in the green amid relatively light newsflow thus far. Looking at the sectors, energy names are outperforming amid the rise in oil prices. Telecom names lag behind with Telenor (-2.5%) weighing on the sector following weak earnings. In terms of stock specifics, William Hill (-14.0%) are at the foot of the Stoxx 600 after reports that UK Chancellor Hammond has accepted the proposal for GBP 2 fixed-odd betting terminals limit. Semi-conductor names took a hit following earnings from AMS (-9.0%) with Dialog Semiconductors (-6.0%) and STMicroelectronics (-1.6%) lower in sympathy. On the flip side SAP (+3.2%) shares are higher post-earnings while BP (+1.4%) shares are fuelled by an upgrade at Goldman Sachs. In FX, the DXY index cleared another key upside technical level amidst more widespread Dollar gains and has also eclipsed 91.000 to expose fair resistance around 91.526 ahead of a stronger chart hurdle circa 91.751. NZD/AUD: The Kiwi has really taken fright amidst the latest Usd leg-up, but also as cross flows vs its antipodean neighbour weigh heavily. Nzd/Usd is hovering precariously just above 0.7100, while Aud/Nzd is only a few pips below 1.0700 after accelerated buying (stops and orders) on a break of 1.0660. However, Aud/Usd has breached a major downside equality level at 0.7611 after mixed/soft Aussie inflation overnight. EUR/JPY/CHF: All pivoting or skirting key/psychological/big figure levels vs the Greenback, with Eur/Usd currently bang on 1.2200 after a slip below on soft German Ifo indices, but finding some underlying support around Monday’s low and just ahead of a 1.2173 Fib. Note, 1.1 bn option expiries at the figure and the 100 DMA at 1.2210 may also cap the upside. Usd/Jpy is edging closer towards 109.00 and its 100 DMA just a pip above, while Usd/Chf is not far from 0.9800. CAD/GBP: Relative ‘outperformers’ among the G10 community, but still weak overall vs the Usd and well off recent peaks, as Usd/Cad dips back below 1.2850 and Cable holds above the top of a support band extending from 1.3920-1.3890. In commodities, Oil has maintained the climb seen on Monday with the Brent front month contract hitting USD 75.27, its highest level since late 2014, following suggestions that the US may still entertain the possibility of exiting the Iran nuclear deal. Gold is uneventful, with the yellow metal remaining around the USD 1326.50/oz level, as safe-haven demand fades. In the metals complex, aluminium saw a fall following an announcement from the US of deadline extensions for Rusal, whilst Dalian iron ore prices recovered from early pressure overnight triggered by a slump in Shanghai aluminium at the open. Looking at the day ahead, France confidence indicators for April, the IFO survey in Germany for April and March UK public sector net borrowing data and April CBI business optimism data are due. In the US, the most significant release is the April consumer confidence print, while March new home sales, February S&P/ Core Logic home prices and April Richmond Fed PMI are also due. Away from the data the BOE’s Woods, Cleland and ECB's Villeroy are due to speak, while French President Macron and US President Trump are due to meet. The main earnings highlights are Caterpillar, Verizon and Coca-Cola. Turning back to our latest credit view update, one of the big themes in it and something we’ve regularly talked about this year is the prospect for higher yields. With yesterday being a fairly quiet day for news-flow - outside of perhaps the latest round of global PMIs (more on that below) - most of the focus was on whether or not we’d break 3% for the US 10y. The morning session saw it pushed to within a whisker of that landmark with the intra-day high of 2.996% made just before 10am BST (versus the close of 2.961% on Friday). Yields largely consolidated after that though (close at 2.976%, +1.5bp) and this morning it’s edged back down to 2.96% although it certainly feels like a case of when rather than if we break 3%. Bond markets in Europe sold-off yesterday following Friday’s weak US bond close and a relief at more stable continental PMIs with yields broadly 2-4bps higher and with 10y Bunds in particular closing +4.6bps higher at 0.634% and the highest since March 9th. Meanwhile, despite the relationship breaking down from around October last year, the USD was actually a bit stronger yesterday as Treasury yields moved higher. Indeed the USD index closed +0.70% and at the highest since mid- January. 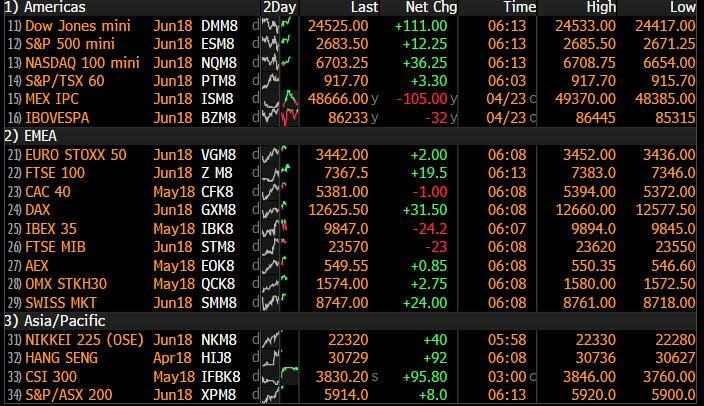 Equity markets were also broadly stronger across the board which seemed to be down to a combination of the PMIs showing no real further signs of deterioration and the news that the US Treasury would provide some sanctions relief for Russia’s Rusal if Oleg Deripaska relinquished control. After the Stoxx 600 closed +0.35% (and +0.72% intraday from the day’s lows) the S&P 500 ended last night virtually flat (+0.01%). The VIX fell for the first time in four days to 16.34 (-3.2%). Equity markets in Russia also closed a bit higher on the news while LME Aluminium (-7.05%) fell the most in 8 years (albeit still up 16.0% since early April when the sanctions were announced). This morning in Asia, markets are trading higher. The Hang Seng (+1.0%) and Shanghai. Comp (+1.96%) are rallying, in part as the China Securities Journal noted liquidity tensions in China may ease while fiscal spending will increase this week. Elsewhere, the Nikkei (+0.67%), ASX200 (+0.52%) are both higher while the Kospi is down -0.18%. After the bell in the US, Google was down -0.4% after reporting higher than expected revenue growth in the quarter. With regards to those PMIs out yesterday, for the Eurozone the flash composite print of 55.2 for April was unchanged relative to the prior month but a small beat relative to the consensus estimate of 54.8. This was driven by an upside surprise in the services sector where the 55.0 (+0.1 from March) reading compared to the consensus of 54.8. The manufacturing reading on the other hand declined 0.6pts to 56.0 (vs. 56.1 expected). For Germany and France there were similar beats at the services sector level although Germany did also see a small beat for the manufacturing print (58.1 vs. 57.5 expected; 58.2 previously). France’s manufacturing reading was closer to expectations at 53.4 (vs. 53.5 expected; 53.7 previously). The data implies a slightly negative read through for the noncore countries in Europe however the bigger story is evidence of some slight stabilisation in the PMIs at least given the overall composite print. Indeed a 55.2 composite reading is in line with +0.6% qoq GDP growth for the region. Meanwhile, for the US the flash composite PMI nudged a bit higher to 54.8 from 54.2 in March. The manufacturing sector was actually the bigger surprise here with the 56.5 print up 0.9pts from March and also well above the consensus forecast for a small decline to 55.2. The services print was also up 0.4pts to 54.4 (vs. 54.1 expected). Notably, the statement also noted that “input price inflation was the quickest since July 2013, with panellists noting that the introduction of tariffs had been a key factor pushing raw material costs higher” and that “price pressures within the factory sector intensified, with the rate of input cost inflation picking up to the fastest since June 2011” with “cost increases partly linked by producers to the introduction of tariffs”. This mirrors a similar story to the prices paid components of the Philly Fed PMI and ISM series. Finally onto Brexit. Bloomberg noted unnamed sources suggests PM May could be forced to accept staying in the EU’s customs union, in part due to pressure from parliament. Yesterday, her spokesman James Slack reiterated her commitment to “leave the customs union and we’ll be free to strike our own trade deals” while Environment Secretary Michael Gove also tweeted his support over the weekend. Looking ahead, we may get more clarity in a House of Commons vote as early as next month. Before we take a look at today’s calendar, we wrap up with other data releases from yesterday. In the US, the March existing home sales rose 1.1% mom to a four month high (5.6m vs. 5.55m expected), while the number of homes for sale fell 7.2% yoy and the median sales price rose 5.8% yoy. Elsewhere, the March Chicago Fed national activity index was below expectations at 0.1 (vs. 0.28 expected). Looking at the day ahead, France confidence indicators for April, the IFO survey in Germany for April and March UK public sector net borrowing data and April CBI business optimism data are due. In the US, the most significant release is the April consumer confidence print, while March new home sales, February S&P/Core Logic home prices and April Richmond Fed PMI are also due. Away from the data the BOE’s Woods, Cleland and ECB's Villeroy are due to speak, while French President Macron and US President Trump are due to meet. The main earnings highlights are Caterpillar, Verizon and Coca-Cola.